Welcome to Mrs. Hart's Book Nook- a place for students and teachers to share their love of books! Today our guest blogger is Ben P. in fourth grade. 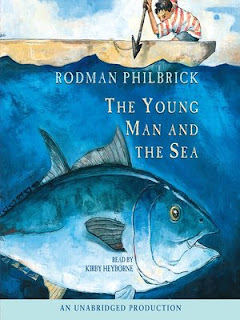 I think you should read Young Man in the Sea By Rodman Philbrick. I have three reasons why you should read Young Man in the Sea. My first reason why you should read Young Man in the Sea is because he is smart. He takes care of himself and his drunk father. My second reason why you should read Young man in the sea is that he visits people down the Canal. One of them is a guy that his father used to work for and he is the one that made the boat. My last but not least reason why you should read Young Man in the Sea is because he never gives up in the ocean. He went thirty miles just for money and a bad guy named Tyler Craw always makes fun of him about his skiff. He got it for his fifth birthday. Tyler Craw cut the traps. Conclusion I hope you like this book and read Young Man in the Sea. It is my favorite book. 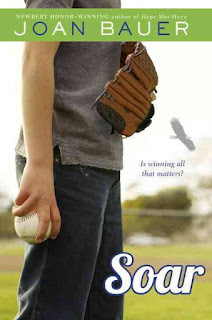 Back in October I made a post about the book, Soar, by Joan Bauer. I hadn't thought much about the book until Wesley came home with it the other day. We were talking about it again, and I was reminded of what a great and powerful book it is. Thinking about this book also took me back to what we were doing while we listened to it. I can remember exactly where we were when the conversation below occurred (we were on the highway, driving home from Augusta). I can feel how happy I was to be with my kids after they were away for the night, and how great it was to have this love of sharing stories with them (or at that moment, just Wesley!). I can still hear Esther in the back seat wishing it was over, and Wesley and I trying to shush her and say it almost was. It's been a long time since I've had a blog entry, but that doesn't mean that my BCS friends haven't been reading! 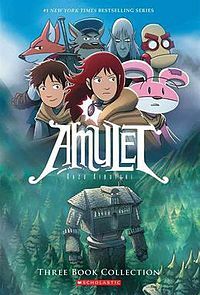 Today we have a review of the Amulet series which has been a big hit among the fourth and fifth grades. Take a look and let me know what you think! Amulet Series By:Wesley Charles Hart Have you seen the Amulet (By Kazu Kibuishi) books? If you haven't you should! There are seven books. You can read them all. Book 8 is coming out in September. I have three reason why Amulet books are the best! Reason one that Amulet is the best book ever is because you can get hooked on the first three pages and by the end you will be impatient to get the next book. The second reason is that you get to meet lots of different characters and different machines too. It is a great series. 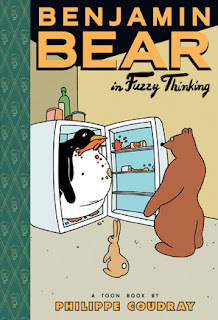 Taylor Stark from 3L has read the book, Benjamin Bear, which is a graphic novel by Phillipe Coudray. Here is what Taylor has to say about the book: Benjamin Bear: The reason why I like Benjamin Bear is that it is funny and it teaches you things, like what not to do. And it teaches you new things. The most likely reason of all is that they are friends. The reason why I don't like this book is because Benjamin Bear brags about winning. I would recommend this book to people who like funny books. People who like friendship and people who like to learn new things. Thanks for your review, Taylor! I hope everyone enjoys this book! It is a series that I look forward to exploring. Happy Reading! Today we have a review by Ella Cook in 2R. 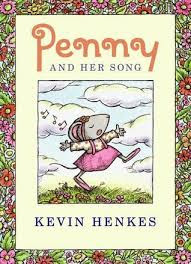 She read the book, Penny and her Song, by Kevin Henkes. Penny kept on trying to sing her song. Penny was the main character. She was a mouse and she had a love of music. I liked that it had a happy ending. Ella, thank you so much for taking the time to share this book with us. Just like you, I love a happy ending! Ready Freddy is always a favorite series! Today, Averi G. in 3L is going to review, Ready Freddy and the Gingerbread Jitters by Abby Klein. This is a perfect book as Christmas approaches! I like this book because I like gingerbread houses. In it, Freddy took some shaving cream and was making a Santa beard. Then Freddy climbs a tree and breaks his arm. At school he makes gingerbread houses. I recommend this book to people who like Ready Freddy. One thing I don't like are the Freddy's Fun Pages because they make the book longer and my mom makes me read them. Averi, thank you for sharing this book with our readers! I know many of them enjoy our friend, Freddy. Today our special guest book reviewer is Charlotte C. in Ms. Rice's room. She is reviewing a great picture book: Charlotte and the Rock by Stephen W. Martin. Look at all of Charlotte's hard work! Thank you Charlotte for sharing this funny book with us! It is in our learning commons, so be sure to look for it.